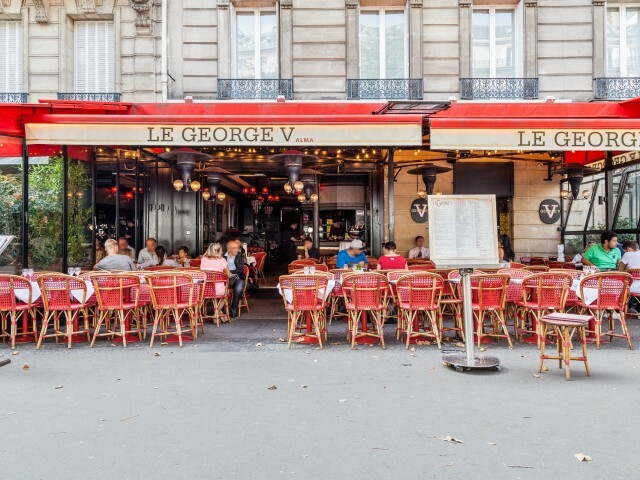 The Georges V is a bar-brasserie of 8ème arr. From Paris, a stone's throw from the Champ-Elysées theater, the boats, the Palais de Tokyo and the Champ-Elysées. We offer a typical French menu, including Aubrac meat matured by our house. We are open 7 days a week, from 6:30 am to 2:00 am on weekdays, and from 8:00 am to 2:00 am on Saturday and Sunday. In summer, our covered terrace allows you to enjoy the sun, and the room is air-conditioned. In winter the terrace is heated. We also offer mobile phone chargers. Finally, we will be happy to organize your after-work, dinners, and other events, making available the lounge side of our restaurant, available for your privatization, up to 40 people. Please contact us at 09 70 38 60 78.